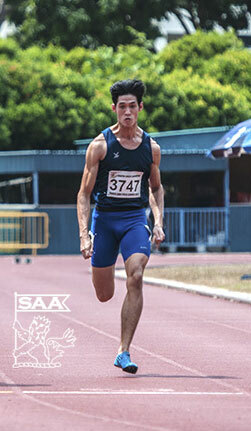 Edwin Chia Hui Kai will be representing Singapore in the Men 200 Meter Dash Open & Men 400 Meter Dash Open at the 76th Singapore Open Track & Field Championships 2014. Here’s is his profile awareness of our selected National Athletes for the competition. This will be the first time I have competed having gone through a seasonal type of training with my coach and I feel that the hard work put in will show itself when it counts. Over the short duration that I have been in track and field I have had the great opportunity to race in a neighboring country to expose myself to various athletes and the climates that they train in to better prepare myself for future races. There is always something to improve upon even if the timings remain the same or even increase slightly, as long as there is progress, there should be no doubt that things will come together at the end for a better race. There’s reason to believe that I am able to break my own personal records in both the 200m and 400m with the training that I have gone through. Racing against other athletes from various countries will be superb exposure and will test the mental tenacity as much as my physical fitness. The confidence of a better timing should not be disturbed by the presence of audiences or competitors since every race is and always will be just you against the clock. Tyson Gay has always been my favorite track star in the world of athletics; known for his impressive top end speed which has proven to be able to keep up to the paces of Usain Bolt in Berlin 2009 in the 100m final. I enjoy the way he is serious and passionate about his sport and his determination towards improving himself. In a sort of parallel, he has similar race strengths and weakness having a slower start but a strong finish as I do. However I am more impressed when athletes with totally different builds are able to come close to world record times, athletes such as Warren Weir from Jamaica, Trayvon Bromell from USA and Yoshihide Kiryu from Japan give me hope that there is absolute power in honing good techniques and execution of it within races. I never once took part in a true sprint event until it was the tail end of my National Service where I had the chance to take part in a 10 x 400m race within my camp. It was the first time I wore spikes which I had borrowed and it felt awkward under me. After the 10 man relay I felt an adrenaline rush from the whole event and that experience stuck with me for a long time. It was no surprised when I was wondering what extra-curricular activity to choose in university that I naturally gravitated towards track and field. I pursued the idea and found my current coach eventually and began training with him.